The cosmos flower may have been one of your grand grandmother’s favorite flowers, as it has been a popular bedding plant for years. Cosmos are annuals, meaning that they only live for one season and then must be replanted in following years. They have showy, sometimes large (up to 5 inch) daisy-like flowers atop stems with ferny leaves. They are not complicated to grow, and thrive in most types of soil. Cosmos prefer warm weather and regular to poor garden soil. They are traditionally a lovely shade of lavender pink, but also come in orange, yellow, red, white and maroon. Cosmos are a boon for any flower bed, but are especially useful if you’d like to attract butterflies, bees and many beneficial insects to your yard. The most well-known cosmos is the single, pink and white daisy-like flower. However, about 20 varieties of cosmos exist. Some of these flowers are annual, others perennial. In many cases, annual cosmos self-seeds, so you may get your lovely flowers back the following year after they are planted. Sonata, which is an approximately 20 inch tall flower in such colors as white, pink, and cherry red. The medium green ferny foliage completes the total look of this lovely flower. Seashell, which comes in colors such as cream, rose and medium pink. These eye-catching flowers have rolled petals that remind one of sea shells, hence the name of the variety. Double Take, which has large, 3 inch blooms with cheery yellow centers. This plant reaches up to 4 feet tall and has only pink flowers. For a statement plant for the back of a flower bed or next to a fence, choose the fabulous Double Take cosmos. Cosimo, which has more petals than the above mentioned cosmos flowers. The colors of the flowers are deep red and pink/white bicolor. Cosmos sulphureus is a Mexican native flower. This posy prefers poor, dry soil, and may not do well in overly rich or cultivated ground. This variety is usually smaller than the pink/rose colored varieties of C. bippantus and comes in bright colors such as bright red, deep orange and golden yellow. Varieties of this flower include Ladybird, Cosmic, and Sulphur. You may start your cosmos early indoors about one month before the last frost of spring is expected. When the seedlings are approximately three inches tall they should be transplanted into larger pots or outdoors if weather permits. Be sure to harden your cosmos off by putting the plants outside during the day and bringing them indoors until the nights are warm enough to place the flowers outdoors in your flowerbed. They may look a little bedraggled for a day or two. Once they accustom themselves to being outdoors, however, they will explode with blossoms. Cosmos seeds are large and easy to see and plant. Use a good potting mix placed in small containers or peat pellets. Place the seeds about ¼ inch under the surface of the dirt and keep the container’s contents evenly moist. They grow quite quickly, so be ready to transplant them when they are about three to four inches tall. You can also plant cosmos seeds outdoors in tilled soil. Cosmos need regular garden soil, and don’t require feeding or rich soil to thrive. Rich garden soil gives you lovely leaves with few flowers. Plant the seeds about ¼ inch under the ground and about 12 inches apart. Water but do not overwater. In about seven weeks your first bloom should appear. Once blooming begins, it continues freely until frost. Cosmos readily sets seeds, so pinch them off if you want blooming to continue. You might desire to let some of the flower’s brown seed heads to remain in their garden spot to reseed next year. Or collect the seeds to replant elsewhere in your garden. Deadhead faded or dead blossoms to keep the flowers blooming until the end of the season. Most cosmos plants are rather tall, so you may need to stake them to keep them upright. 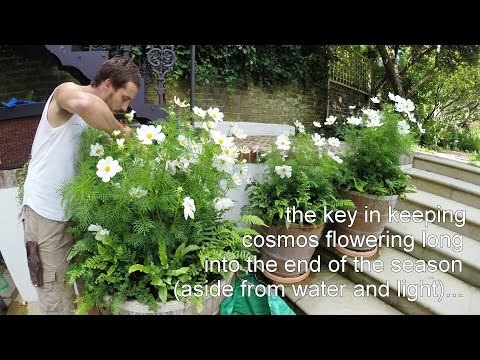 Plant you cosmos plants in a place that protects them from high winds yet provides them with plenty of sun. One way to easily support your cosmos is to plant them against a fence or wall. Do not overwater cosmos. Overwatering and fertilizing leads to fewer blossoms. Allow the soil around cosmos plants to dry out before watering. If you have a spot that get baked in the sun, plant your cosmos there. Keep your cosmos beds weeded, since cosmos readily self-seeds. Powdery mildew. Avoid this problem by watering in the morning and watering when the plant’s soil is dry. Don’t water cosmos late in the evening. Gray mold. Don’t water cosmos too frequently or in the evening. Everyone has a spot in their yard that may not be the best soil but needs a spot of color or some softening. Choose cosmos as an elegant, ferny addition to your landscape, yard, next to your house or towards the back of your flowerbed. Save the seeds from year to year to ensure enough seed for the next years’ cosmos bed. You’ll love this sturdy and beautiful plant and flower that will be the talk of your neighborhood.